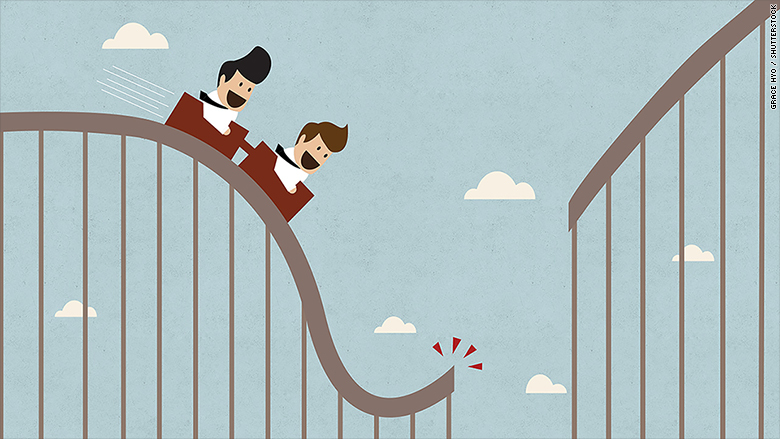 Investors have been taken on a wild ride this summer that's been nearly unprecedented. The craziness was punctuated by the Dow's 1,000-point nosedive on August 24, its largest intraday point decline on record. But here's an even more telling sign of the swings: Bespoke Investment Group tracks "all or nothing days," which occur when at least 80% of the S&P 500 advances or declines. In other words, herd mentality drags nearly the entire market in one direction or the other. During the 12 trading sessions between August 20 and September 4, there were eight all or nothing days, according to Bespoke. There have only been two other times since 1990 that there were as many all or nothing days in that short of a period. "These events have been extremely rare," Bespoke wrote in a research report. Related: Stocks bounce back...for good? The most recent wild ride occurred in the fall of 2011 when Wall Street freaked out about the U.S. credit rating downgrade and turmoil in Europe's debt crisis. Bespoke said the only other time its all or nothing volatility measure was at such extreme levels was during the financial crisis in 2008. Other measures of volatility also look elevated. The VIX, known as the market's fear gauge, spiked above 50 on August 24 for the first time since early 2009. It has since retreated below 25. CNNMoney's Fear & Greed Index is back in "Extreme Fear" mode. The Dow, which typically moves about 150 points between peak and tough throughout the trading day, has experienced average daily swings of more than 400 points since August 19. The jitters have been triggered by concerns that China's economic slowdown will drag down the rest of the world just as the Fed ends its emergency support. After six years of extremely low rates, the Fed may raise rates next week. That could be a negative for risky assets like stocks that have benefited from easy money. "In the past the stock market didn't need the economy because the Fed had its back," said Brent Schutte, senior investment strategist at BMO Global Asset Management. Are robots making things worse? Market observers are also wondering how much of the turbulence is being exacerbated by high-frequency trading. These sophisticated market players move at lightning fast speeds by using computer algorithms. When times are good, their presence makes it easy and inexpensive for investors at large to buy and sell stocks. But critics argue they step away during times of turmoil, aggravating the wild swings. Some point to the mini flash crash experienced by General Electric (GE)and exchange-traded funds on August 24. "When you have 1,000-point moves in a morning and then a recovery, it's hard to believe it's all just individual traders and money managers moving money around for fundamental reasons," Schutte said. It's easy to see how the market craziness would scare away mom-and-pop investors. But recent history suggests that could be the wrong move, at least for long-term investors. The S&P 500 tumbled 15% during the three months following its period of extreme volatility in late 2008, according to Bespoke. However, one year later the index was up a hefty 25%. "Rather than exit the markets, investors should consider staying the course and seek potential opportunities along the way," Russ Koesterich, BlackRock's chief investment strategist, wrote in a note to clients on Wednesday. While he warned that volatility may continue, Koesterich believes "some pockets of value have emerged," especially in European stocks and large-cap, cyclical stocks in the U.S.